Netherlands – Glide through the splendid tulip gardens of Keukenhof. Italy – Discover Raphael’s birthplace and explore the world’s smallest and oldest republic, San Marino. France – Indulge in Lyon’s famous gastronomy scene, dining in Michelin starred restaurants and joining a private cooking workshop. Switzerland – Explore the winding streets and 14th century buildings at the tripoint of the Swiss, German, and French borders. Germany – Attend an evening performance at Elbphilharmonie, one of the largest and most acoustically advanced concert halls in the world. Spain – Gain insight into prominent artists like Salvador Dali, Gaudi and Miro as you tour a few of their masterpieces. Arrive at Schiphol International Airport; enjoy VIP Fastrack service and transfer to your Riverview Suite accommodations. Meet fellow travelers and your Lakani Tour Manager at an evening cocktail party. Explore highlights of Amsterdam on a walking tour. Glide through the splendid gardens of Keukenhof. Choose your own activity: a tour of the Hague, explore picturesque villages including Volendam and Edam; or VIP admission to Rijksmuseum, Van Gogh Museum, and Stedelijk Museum. Board the Lakani Jet and head to the Adriatic city of Rimini. Settle into your sea-view suite in the legendary luxury hotel. Tour the world’s smallest and oldest republic, San Marino; discover Raphael’s birthplace and learn about his life; and follow in the footsteps of Dante, Italy’s famous poet, on an excursion to Ravenna. Travel by Lakani Private Jet to Lyon and transfer to your Suite accommodations in the luxury boutique hotel overlooking the old city. Walk through old Lyon and discover semi-hidden passageways in Croix Rousse. Indulge in the gastronomy for which Lyon is famous for – dining in two Michelin starred restaurants and participating in a private cooking workshop. Straddling the Rhine, Basel is at the tripoint where the Swiss, German and French borders meet, the city became a focal point of European intellectual life since the 14th century, We’ll trace Basel’s eventful past through the winding streets of the well-preserved old town, the Altstadt, where the oldest buildings are from the 14th century. Fly aboard the Lakani Jet to Hamburg where a Lake View Suite awaits you. See the highlights of the city, including Speicherstadt, a UNESCO World Heritage Site, and its International Maritime Museum. Visit the astonishing Elbphilharmonie, one of the largest and most acoustically advanced concert halls in the world and attend an evening performance. 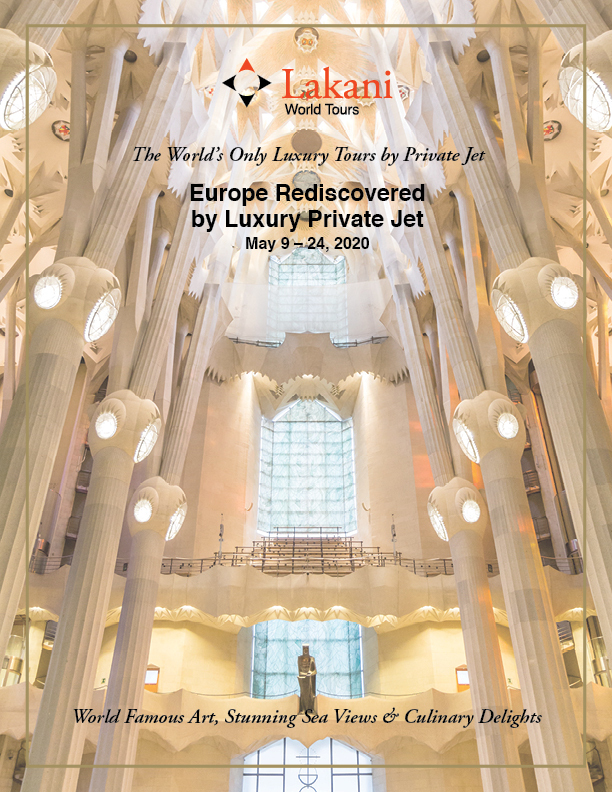 Your final flight on the Lakani Jet takes you to the vibrant Mediterranean city of Barcelona and your suite overlooking the impressive Paseo de Gracia. Tour the city and gain insight into prominent artists like Gaudi and Miro and see their masterpieces, including the Miro Foundation, Casa Mila, and the Sagrada Familia. Drive to Figueres, the birthplace of Salvador Dali, to see his self-designed Theater Museum. Bid farewell to Europe and your newfound friends as you transfer to the airport for your flight home or to your next destination.